"MR. P Is A MASTERFUL STREET TECHNICIAN!" ANYWHERE .. TO HYPNOTIZE ANYONE IN SECONDS ! And Why it is essential, these techniques need to be part of your hypnotic toolkit? The importance of Removing hypnotic suggestions And Having Them Leave FEELING GOOD! Post hypnotic Suggestions That Schedule in Automatic New Behavior Changes After They Open Their Eyes. How To Awaken Clients From Trance, Feeling Refreshed . Relaxed. Loving it! A Drop In the Temperature Change Skit... Hot goes to Arctic .. Arctic Goes to Equatorial.. The Bike Race To The Finish .. This Will Get their Hearts Poundng. Turn them into an instant Dancer ... have them do the forbidden dance - The Lambada. Plus many, many more skits.... in a 'hands-on' class that is fun and SAFE!!! Bonus Techniques YOU WILL ONLY LEARN IN THIS COURSE ! Carl Pruitt whose (stage name, Mr. P) is certified in several modalities of hypnosis: Clinical, Stage, Past-Life Regression, Smoke Cessation, Weight Loss, Sports, and Pain Management hypnosis. He began entertaining audiences in 1982 as a magician and re-entered the entertainment field, incorporating hypnosis into his repertoire in 2006. His audiences stretch across the globe and through his YouTube videos has set a trend and become the World’s Greatest Street Hypnotist. To see Mr. P in action, visit him on YouTube at 35forlife. Best street hypnotist shows you how its done For $1500. or 3 easy payments of 500. each. Special ... Pre Sign Up Special ..... Pay In Full ....Take 500 dollars off ... Enroll today. But most of all .... You're going to have fun ! Learn Lighting Fast Instant Inductions that Work Everytime, Anywhere! 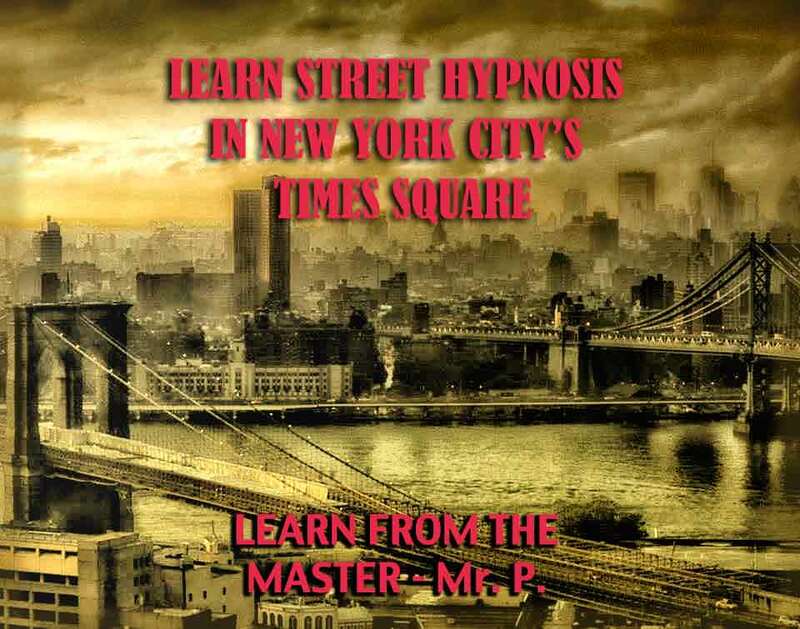 Create An INSTANTANEOUS Street Hypnosis Stage Show ... ON THE FLY ! nd why they work, then see them demonstrated live, with real people in the real world. You Can llearn the theory in hypnosis Classes, but you will NEVER GET THE SKILLS. AS A MASTER HYPNOTIST ! $1,500 ..... Save Now !! CLICK BELOW AND GET IN !!! With Master Rapid, Hypnosis Techniques To Instantly Drop Participants in a Fun and Entertaining, but profound trance. Coming .... Bangkok Thailand Street Training !